Commercial quality sheet steel with an upper temperature limit of approximately 1000º F., particularly if conditions are oxidizing. Not suitable for handling crude acids or aqueous solutions of salts in the neutral or acid range. 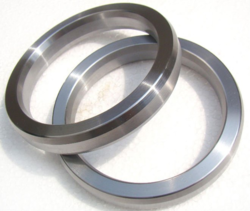 A high rate of failure may be expected in hot water service if the material is highly stressed, Concentrated acids and most alkalies have little or no action on iron and steel gaskets which are used regularly for such services. At least 80% of applications for non-corrosive services can use Type 304 Stainless in the temperature range of -320 F to 1000º F.
Excellent corrosion resistance to a wide variety of chemicals. Subject to stress corrosion crackling and to intergranular corrosion at temperatures between 800º F to 1500º F in presence of certain media for prolonged periods of time. An18-12 Chromium-Nickel steel with approximately 2% of Molybdenum added to the straight 18-8 alloy which increases its strength at elevated temperatures and results in somewhat improved corrosion resistance. Has the highest creep strength at elevated temperatures of any conventional stainless type. Not suitable for extended service within the carbide precipitation range of 800º F to 1650º F. when corrosive conditions are severe. Recommended maximum working temperature of 1400º F.
Continuous maximum temperature range of 1400º F -1500º F.
Carbon content held at a maximum of .03%. Subject to a lesser degree of stress corrosion cracking and also to intergranular corrosion than Type 316. An 18-10 Chromium-Nickel steel with a Titanium addition. Type 321 stainless has the same characteristics as Type 347. PETROMET FLANGE INC manufactures ring type (inside bolt circle), full face (entire face of flange with bolt holes) and tailor made (as per drawing). These gaskets manufactured to asme b16.21, designed to suit asme b16.5 and asme b16.47 flanges. Din 1514-1 and en 12560-1 for din and bs flanges. Other non- standard gaskets are manufactured as per customer specific requirements. Excellent gasket has better team to design and manufacture as per customer requirements. These gaskets are available for all the services. This gasket are best with good strength (metal inside) with proper sealing (soft layer). PETROMET FLANGE INC MFG Ring type joint gaskets WHICH comprises of two types such as oval cross section and an octagonal cross section. These types of gaskets are used in pressures up to 10,000 psi. The dimensions are standardized and require specially grooved flanges. 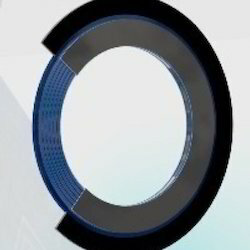 Sealing occurred in octagonal cross section with the wedge contact, oval cross section with single line contact. The flat bottom groove design will accept both the octagonal and oval cross section. The sealing surfaces on the ring joint gasket and grooves must be smoothly finished to 63 micro inches and to be free of objectionable ridges, tool or chatter marks. 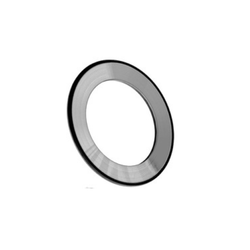 PETROMET FLANGE INC EXPORTS bx ring gasket differs from the standard rx, oval or octagonal shape since it is square in cross section and tapers in each corner. Bx is used at pressures up to 20,000 psi. The bx gaskets will have pressure relief hole at mid portion of c. The sealing surfaces on the ring joint gasket and flange grooves must be smoothly finished to 32 micro inches and to be free of objectionable ridges, tool or chatter marks. PETROMET FLANGE INC EXPORTS Concent Concentric 'v' grooves on the flat metal. Pitch of the groove normally 1 to 1.5mm, groove depth will be 0.4 to 0.7mm. These gasket required top of the 'v' groove 0.1 to 0.2mm flat will give required to seal. Grooved metal gaskets are sealing occurred by metal to metal contact. These gaskets are normally much softer than flange material. The surface finish of the flange material are lesser than 63 micro inches. These gaskets required high seating stress. These gaskets required more bolt load than any other gaskets. Every groove will acts as separate seal. 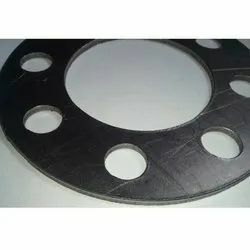 PETROMET FLANGE INC EXPORTS DELTA TYPE GASKETS A delta gasket is a pressure actuated gasket used primarily on pressure vessels and valve bonnets at very high pressures in excess of 5000 psi. As with the lens gasket, complete drawings and material specifications must be supplied. Internal pressure forces the gasket material to expand when the pressure forces tend to separate the flanges. Extremely smooth surface finishes of 63 micro inches or smoother are required when using this type of gasket. PETROMET FLANGE INC manufactures rubber cut gaskets, ring type (inside bolt circle), full face (entire face of flange with bolt holes) and tailor made (as per drawing). These gaskets manufactured to asme b16.21, designed to suit asme b16.5 and asme b16.47 flanges. Din 1514-1 and en 12560-1 and bs flanges. Other non-standard gaskets are manufactured as per customer specific requirements. 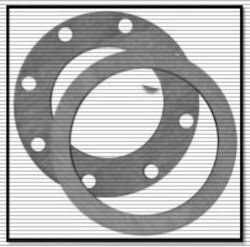 Excellent gasket has better team to design and manufacture as per customer requirements. These gaskets are available for all the services. Rubber gaskets available in all the grade of rubber ie. Natural, chloroprene (neoprene), nitrile (nbr), sbr, epdm, silicon, viton, butyl, buna-n etc. PETROMET FLANGE INC IS THE BIGGEST MFG OF gasket WHICH manufactures graphite, ring type (inside bolt circle), full face (entire face of flange with bolt holes) and tailor made (as per drawing). These gaskets manufactured to asme b16.21, designed to suit asme b16.5 and asme b16.47 flanges. Din 1514-1 and en 12560-1 for bs flanges. Other non-standard gaskets are manufactured as per customer specific requirements. 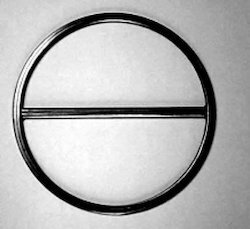 PETROMET FLANGE INC MFG gasket provides this type gaskets, consist of a gasket (winding + filler) with a solid metal outer guide ring. A winding with an alternate combination of a steel strips and soft non-metallic filler with solid outer guide ring. These gaskets can be used on plain flat face flanges and on raised face flanges. 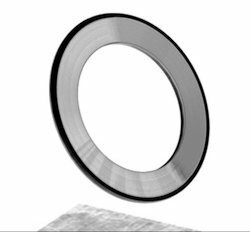 The outer guide ring serves to center the gasket properly in the flange joint, acts as an anti-blowout device and compression gauge to prevent spiral wound gasket to prevent the spiral wound component from being crushed. Normally the outer guide rings are furnished in mild steel (carbon steel), but can be supplied in other metal when required by operating conditions. PETROMET FLANGE INC provides this type gaskets, consist of a gasket (winding + filler) with nose (bare) outer winding a solid metal inner ring and outer bare (nose) winding. A winding with an alternate combination of a steel strips and soft non-metallic filler with solid inner ring and outer nose (bare) winding. This type gaskets are mostly used in heat exchangers where the minimum space available. Primarily, it provides radial support for the gasket on the inner diameter to help prevent the occurrences of inside buckling, collapsing and imploding. Its inner diameter is normally sized slightly larger than the inner diameter of the flange bore, minimizing turbulence avoiding uneven flow. The inner rings are normally supplied in the same material as the winding strips in spiral wound component. Outer nose winding is used material same as of winding metal. PETROMET FLANGE INC provides this type gaskets, consist of a gasket (winding + filler) with nose (bare) outer winding a solid metal winding as outer bare (nose) winding. A winding with an alternate combination of a steel strips and soft non-metallic filler with solid outer nose (bare) winding. This type gaskets are mostly used in heat exchangers where the minimum space available. 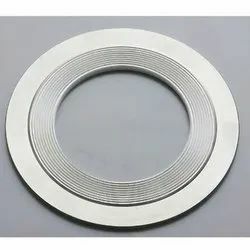 The inner diameter of gasket larger than the flange bore; outer nose winding is used as same material of winding metal. In some type where partition plates are available, the gasket shall have partition ribs made out of double jacketed or solid metal. For these drawing or details must be given by customer. 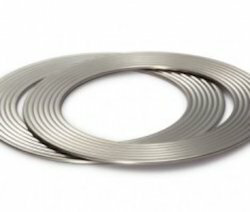 Type WGR-Grooved Metal Soft Layer Sheathed Gasket Kammprofile gasket of this type is manufactured without a guide ring it is comprised of a core metal of any specification as required with concentric grooves on both sides that covered with graphite or expanded ptfe. It is typically used in heat exchanger applications and applied as an upgrade to double jacketed gaskets or exchanger spiral wound gaskets especially when lower load is needed. When partition required same shall be attached with inner diameter of grooved ring. 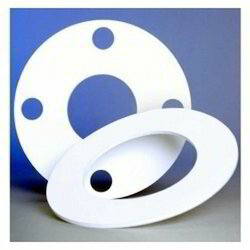 PETROMET FLANGE INC MFG THIS TYPE gasket of this type is processed along with a loose fitting guide ring. This popular design is preferred to be used for nominal pipe size and pressure class raised face flanges and is used in equipment with excessive radial shear characteristics, thermal cycling, and expansions. . The gasket comprised of a core metal of any specification as required with concentric grooves on both sides that covered with graphite or expanded ptfe. 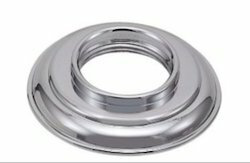 The sealing core is designed and sized per asme b16.20, en-12560-6 spec and depending on the flange specification the loose fit guide ring is sized to fit properly. PETROMET FLANGE INC MFG metal jacketed gaskets used for heat exchangers and large vessels. The metal jacketed gaskets consists of jacketed metal encapsulate with soft filler. The metal jacketed gaskets are designed as per asme b16.20. Metal jacketed gaskets to asme b16.20, designed to suit asme b16.5 and asme b16.47 flanges. Mostly used on equipments, boiler and heat exchangers. Other non-standard gaskets are manufactured as per customer specific requirements.